We were outside shoveling the drive way on December 18 when we saw a big bird soaring aloft. We thought, That is very odd; it must be a turkey vulture but it is long overdue heading south for the winter. Off it headed west on the breeze and we thought that was the end of that — except it wasn’t! Preparing to head out grocery shopping we noticed the vulture had flown into the open garage door without leaving a track in the snow! He nestled in our garage. When approached he made a hissing noise by expending air quickly out his nostrils, and he liked to stomp his feet one foot at a time to show who was boss. My husband Mark called the SPCA who recommended he call a couple of animal rescue services, including Shades of Hope in Pefferlaw, Ontario. It turns out this bird was reported in numerous garages around Tiny Township some weeks ago. The story goes it may have been sick and was too weak to fly at a young age so someone started sheltering and feeding it. 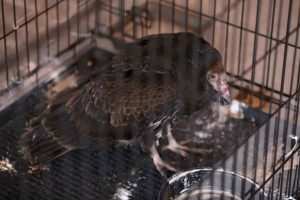 Eventually, we suspect that person either attempted to capture the bird for transport to a sanctuary and it got free, or simply let it go into the winter air, based on information that it would be okay to do so. Now it was socialized to some extent and, even though it could soar with the best of them, its family had long since left for South America, and he had no choice but to do the only thing he knew: go from garage to garage looking for food and shelter, where he was shooed away. No doubt he was cold and desperate. It was so sad! 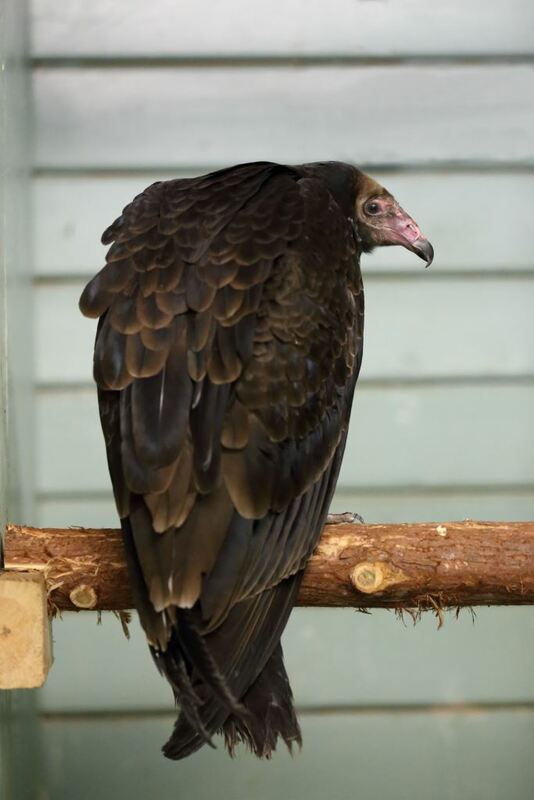 The staff at Shades of Hope animal sanctuary said my husband should find a big bin and try to capture the vulture by approaching it with a large sheet and casting the sheet about the vulture. The vulture and sheet could then be placed in the bin. He tried that to no avail. “Vic” (as we named him) flew up onto the rails for the garage door where no one could reach him. We put cat food out as a lure as per the advice of a man my husband contacted at another sanctuary. The idea was to lure the vulture back to ground level and try again with the sheet. Vic flew down for the cat food but since capturing Vic in this manner seemed very unlikely, my husband called animal control to see if they had further opinions on what to do. We were advised by animal control to keep Vic until the next day until advised on what to do by the Ministry of Natural Resources. The next day the person from the Ministry of Natural Resources called and said that vultures are a protected species. They are no longer endangered (their population once suffered terribly due to the use of DDT). There were no particular regulations around what to do with Vic. The options we had were to shoo the bird once more into the winter air, or to bring him to Shades of Hope Animal Sanctuary. The choice was clear: there is no way we were going to shoo Vic into the winter again. 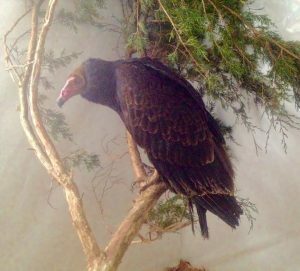 Vultures are not adapted to survive in winter weather. They would suffer frost bite to their unfeathered head and feet, and have no way to detect food under deep snow with their fine sense of smell and telescopic vision. Shooing Vic out again was ensuring his certain death. The mission became to take Vic to the Shades of Hope in Pefferlaw. We cared for Vic by giving him shelter, lots of space, water and food. Vultures have a voracious appetite! He would quickly gobble up ½ pound portions of raw beef burger or steak. Contrary to popular belief, vultures prefer fresh meat, not decaying meat from old carcasses. We are sure, given a few days more, that Vic would have eaten out of our hands. He would approach ever closer when we brought him food, and fussed less and less. There was never a plan to hand feed him or to socialize him even more, and we never did. This bird had to get his strength back, return to the skies to meet up with his friends, and raise a family of his own. Vulture transport: more challenging than you’d think! The challenge was how to get Vic into a container for transport to Shades of Hope. We were quickly successful in luring Vic into a large dog crate using a trail of steak. He stayed there comfortably for the night, with a space heater in the area to keep him warm. The next morning we got permission to leave work to transport Vic to the Shades of Hope. 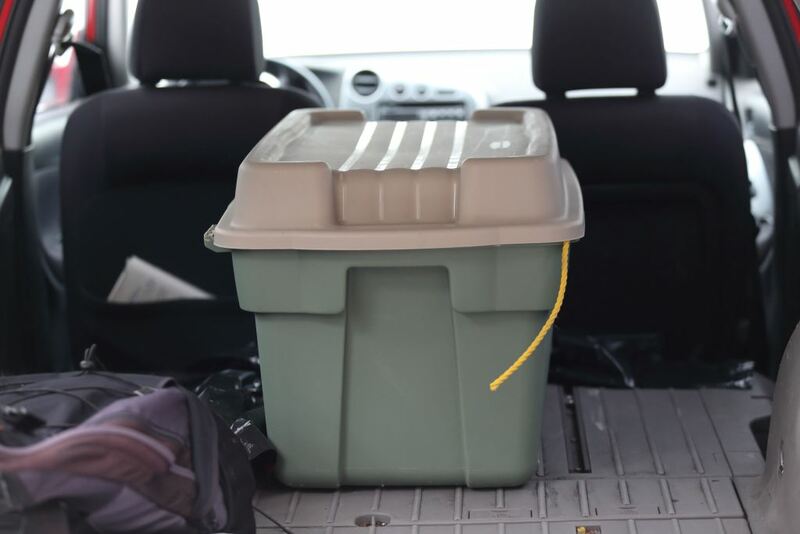 Unfortunately there was a problem: the cage would not fit into the back of our Toyota Matrix! Mark frantically called everyone he knew who may have a van or other suitable vehicle for the warm transport of Vic in the cage, and that included car rental agencies. The search was unsuccessful! That left only one option open: Mark had to go into the cage to capture Vic, and place him in the large plastic bin as per the original plan. Mark was much more worried about the stress to Vic incurred by capturing him than anything else, but there was no choice. At least the cage would prevent Vic from flying upward into the rafters of the garage. My husband climbed into the dog crate and managed to capture Vic in a blanket and nestle him comfortably in the container for transport. Vic flapped a bit during the capture, but it was not difficult. He was quiet once in the darkness of the plastic crate. A rope was placed over the edge of the crate to make sure air would get inside. Mark delivered Vic to the delighted staff at Shades of Hope. 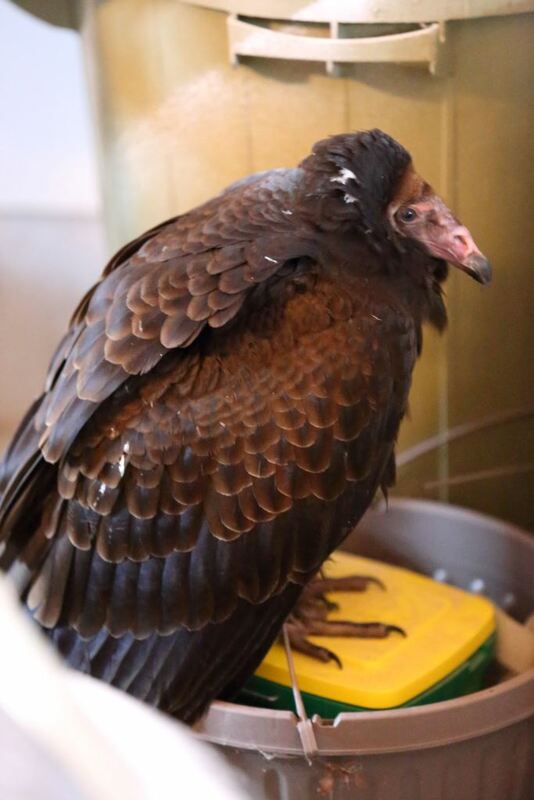 They had never sheltered a turkey vulture before! Mark cracked the lid of the bin open slightly once inside the shelter and Vic peered out. He’d long escaped the blanket. He had not fussed at all during the journey. The bin was placed on the floor of Vic’s new home, a luxurious stall equipped with branches to perch on. The lid of the bin was opened and with a couple of flaps Vic was on the perch. He relaxed quickly and began to preen his feathers. Your turkey vulture is in fine form! We gave him a checkup and he is very young as suspected, but his body condition is good. His tail feathers are in rough shape but that can be fixed with time and space. Your Vic was packed up and driven all the way out to Napanee last night. 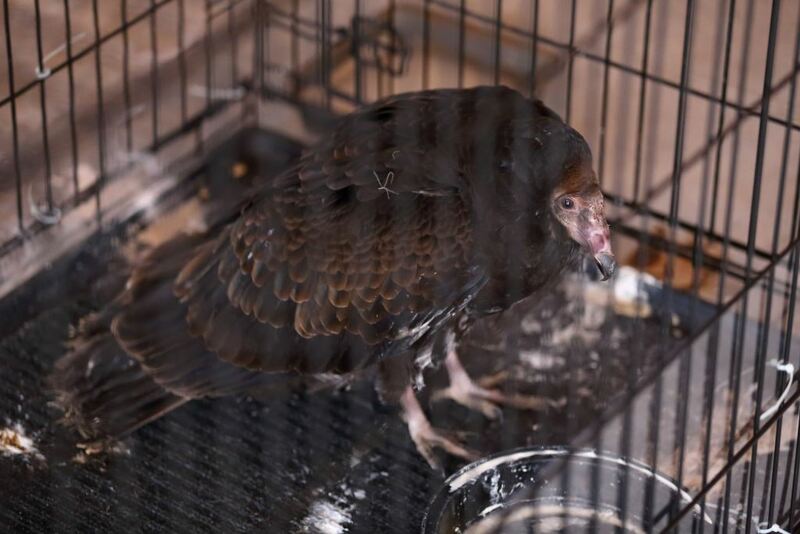 He is now with Sandy Pines Wildlife Centre where he will spend the winter in a large protected outdoor raptor aviary. He has a heat lamp and room to stretch his wings. Thank you for bringing him in. He would not have survived the winter on his own out there. He is doing well has his own room with heating and lamps eating up a storm. He will have to stay inside until the worst of winter is over. They usually migrate once the frost starts in Ontario. Thanks for helping him. This couple just keeps on giving! It happened that Mark’s Honda Civic had reached the end of its road at this time. There was no option but to scrap it, but he knew there was a way that the proceeds from the scrap yard could be sent to charity. 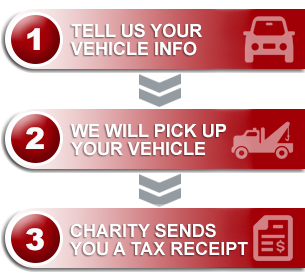 An on-line search quickly turned up Donate A Car Canada. Looking at the long list of charities at Donate a Car Canada one jumped off the screen: Sandy Pines Wildlife Centre! This is perfect, he thought! After a few calls and e-mails the arrangements to have the proceeds from the Honda Civic sent to Sandy Pines Wildlife Center were set in place. The funds will help the center in their wonderful cause of wildlife rehabilitation, and that included Vic. Many thanks to Donate A Car Canada for helping make this happen. Christmas will always be a time when we remember Vic the Turkey Vulture and how he chose us to rescue him from the cold winter. Given the uniqueness of this experience and the time of year that it happened it is hard not to look for deeper meaning. What came to mind is a list of virtues that came into play and how great it was to exercise them: compassion for another soul; caring; kindness; charity; humility for another creature; kindness; determination to see the best result for Vic; gratitude to all who helped and finally thankfulness for the whole experience. Interested in learning what happened to Vic? Check out Part Two of the story!